We are delighted to announce that 1566’s paintwork is complete, including numbers and logos. 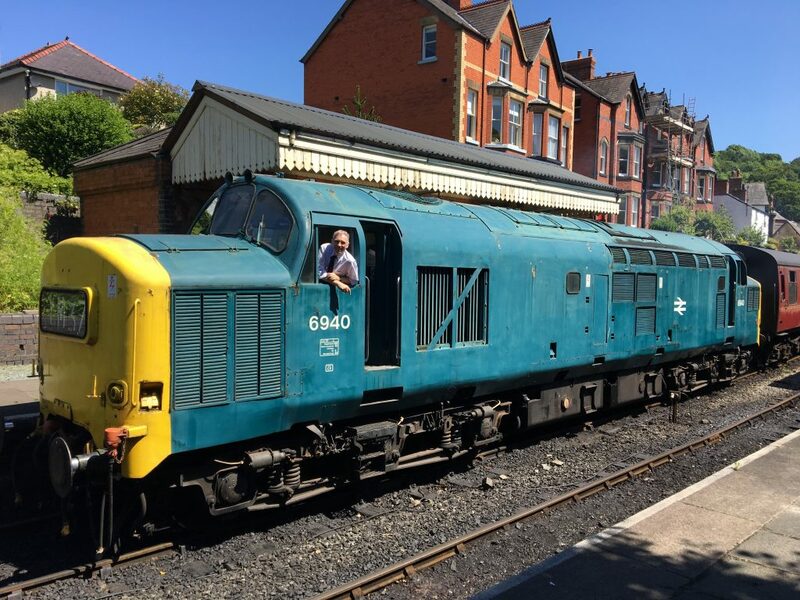 She moved out of Llangollen shed under her own power on Friday 16th June and is seen here at Pentrefelin for her first outdoor photo in her new colours and 1970’s pre-TOPs guise. Whilst we are aware of a few minor details being not quite 70’s (like the NRN aerials), we are sure you will agree that the end result is pretty spot on! 1566 is truly resplendent and the Group are delighted with the results. Great care was taken to achieve a good paint finish. The final two coats of BR blue were mixed with varnish and light flatting of the paint was carried out before the application of the final coat. This has a resulted in a mirror-like finish. Photo by Mark Smales, who has invested many hundreds of hours into the locomotive’s overhaul and done the lion’s share of the work. He is quite rightly proud of what has been achieved. Whilst undercover a number of mechanical issues that came to light on the 7th May test run have been repaired and fettled, including refurbishing a hydraulic roof vent actuator, adjustment to the speeder valve at number 1 end and fixing a large air leak. All being well, 1566 should now be ready to undertake a further loaded test run on the 8th July, working with D5310. 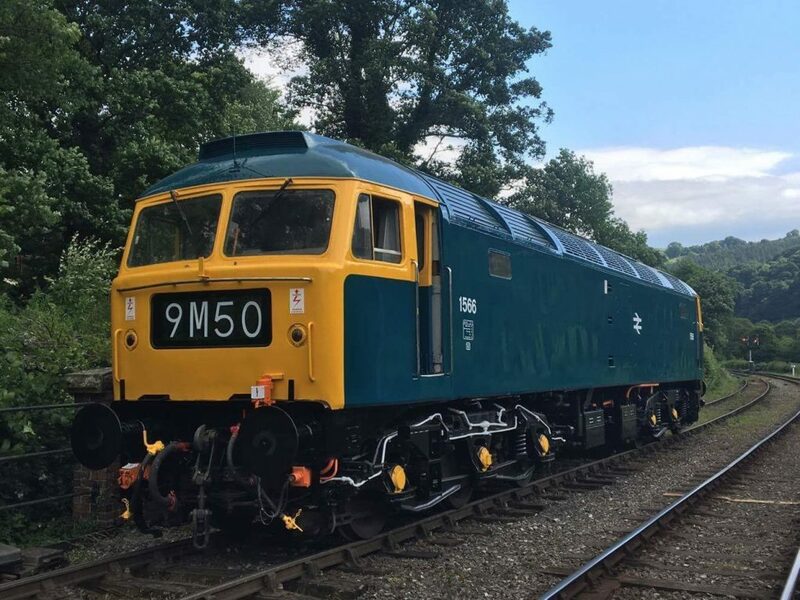 This should pave the way for her formal relaunch to traffic at our Diesel Weekend on September 23rd & 24th. 6940 worked another successful 3 trip running day on June 17th in spectacularly hot weather. She is seen here at Llangollen station with Pete Edwards in the chair. Yes, she is looking a bit tatty – the river side of our fleet all take a proper beating from the weather, so attention to her bodywork is planned as soon as we can – but D5310 is next in the queue. 6940 also experienced a shut-down in Berwyn tunnel on her last trip, but was checked, re-started and soon on her way without any of the drama encountered a few years ago when she was failed in the tunnel after developing a fuel leak. We suspect either a water or oil pressure sensor cut in due to the combination of the 1 in 80 gradient and high temperatures, but will check her over carefully before her next workings. She does use a fair bit of oil these days, another thing that will need attention soon. 6940 should work 3 full trips – 2 to Corwen, inclyding a short layover at Carrog to allow top-and-tail working to Corwen and one trip to Glynyfrdwy. With over 150 classic cars, vintage buses (the latter of which you can ride on) and lorries it looks set to be another excellent event.